Life is a lot like tofu… it is what you make it!!! The fun thing about making a homemade tofu scramble, is that you can go Indian (curry), southwestern (add salsa, hot sauce, peppers), Italian (add pesto and olives)… its all up to your mood! What mood are you in? Usually when I make a scramble I just add some of this and some of that until it turns out just the way I want it. I don’t really have a recipe with measurements figured out. 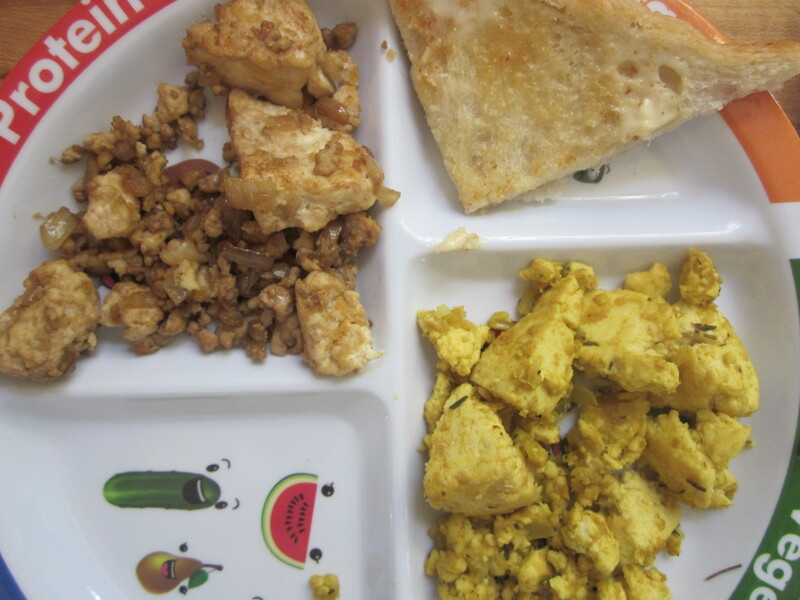 This morning, I wanted that to change, so we decided to have ourselves a little homemade tofu scramble taste test – I basically wanted to try two different scramble bases, to find one the kids liked best so that we could build on and add veggies to… Today we used a curry-based recipe from the book ‘Vegan Brunch’ by Isa Chandra Moskowitz. The other was a quick one I threw together (with similar flavors in our favorite fried tofu) using sesame oil, soy sauce & nutritional yeast. I started out by sauting some onion and garlic in some olive oil. Then I added the tofu, crumbled into big chunks. Once it browned a little, I split the mixture into two pans and seasoned them separately. This is only ONE block of tofu, divided equally, the top is the curry blend. 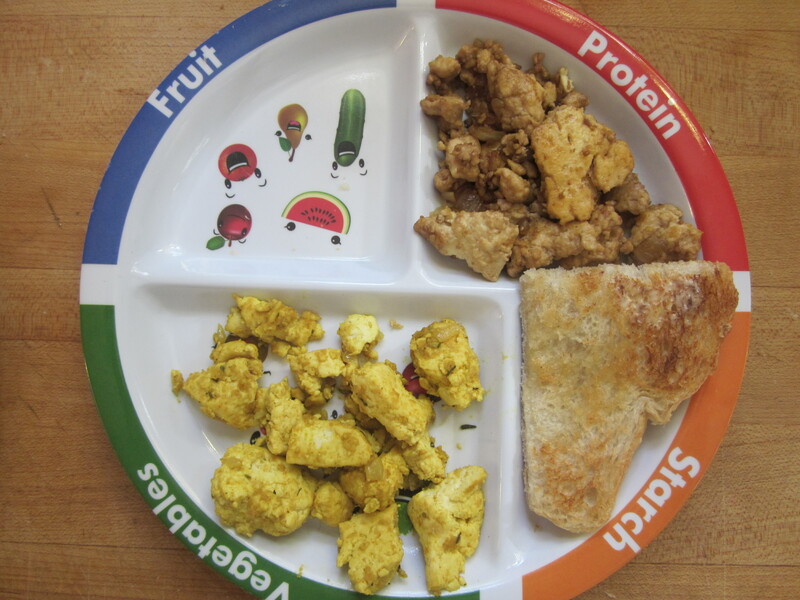 Results: My son LOVED the curry based tofu, which was a total surprise! I thought maybe it would be too heavily flavored for the kids. I actually preferred the sesame/soy one. 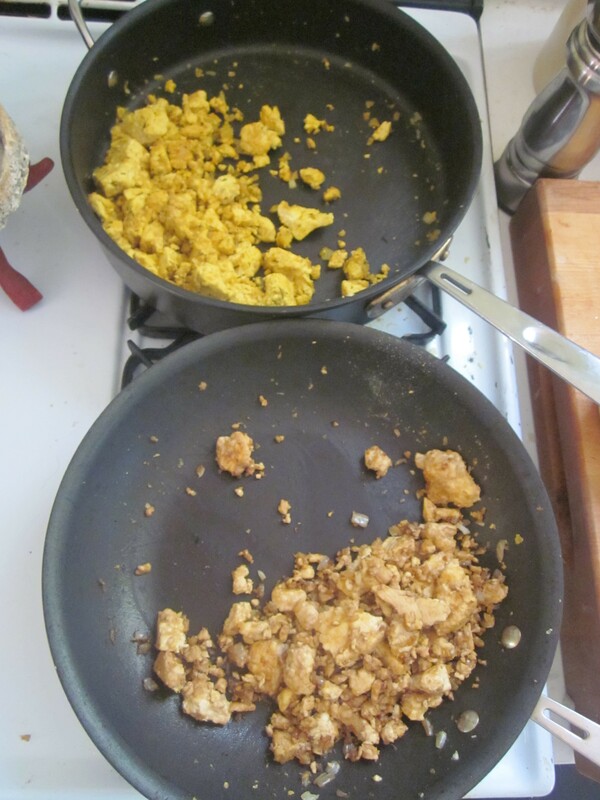 My daughter was a little pickier about her tofu this morning… she tends to prefer my “old fashioned” scramble – this is when I just go for broke into my spice cabinet, adding dry herbs (dashes of basil, oregano, thyme), heavy on the dry mustard, dashes of soy sauce, nutritional yeast (and that onion/garlic mixture – shhh! don’t tell her! )… see what I mean about no measurements? 😉 Anyway, Id love to hear which one YOU like the best! The recipes below are for a full portion (using 1 full block of tofu each). 1) Mix the spices together in a small cup. Add the water. Set aside. 1) Saute a small/medium onion (I like mine minced so my kids wont know they are eating it!) and 3-4 cloves of garlic (minced) in a little olive oil. Cook about 5 minutes until onion turns translucent. Set aside. 2) Heat 1 Tbsp or so toasted sesame oil in a pan over medium heat until hot. Add the tofu and cook until tofu starts to brown lightly. 3) Add 2 Tbsp soy sauce and mix gently, trying not to turn all your chunks into crumbles. Sprinkle generously with nutritional yeast, sauté about 5 more minutes before serving. You can drizzle a little more sesame oil over the top if you so desire. Again, feel free to add veggies or anything you’d like! Toasted sesame seeds, some leafy greens like kale, even some minced ginger. Get creative and then… DEVOUR! !